Despite the fact that both in Cameroon and Nigeria drills are protected under local law, the fight to save the drills is more important than ever before especially on the International front, one of these projects is “Pandrillus”. Pandrillus founders Liza Gadsby and Peter Jenkins have worked in Nigeria and Cameroon since 1988 to save the highly endangered Drill monkey () from extinction. 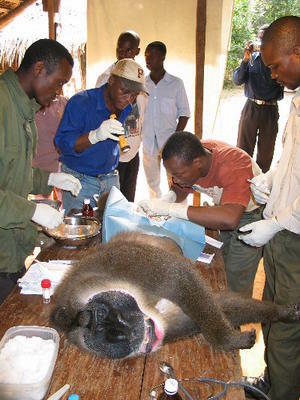 Pandrillus projects use a multi-faceted approach containing and activities; including habitat protection, captive care and breeding programmes, research, training, small scale development schemes, and positive advocacy, all aimed at promoting the Drill as a species and wildlife conservation generally. Projects collaborate with state and national government, communities, traditional rulers, other international and local NGOs (non-governmental organisation), Zoos, advisory groups the private sector to achieve these goals. Pandrillus operates in Cameroon and Nigeria as a “non-profit making” organisation registered in Nigeria, In America is the “Pandrillus Foundation” also classified as “non-profit making” association. In 1991 Liza Gadsby and Peter Jenkins laid the foundation for Pandrillus with the founding of the Drill Ranch in the state of Cross River in Nigeria. This rehabilitation and breeding center currently looks after 210 monkeys divided into six Family groups, who were held illegally and have been confiscated through the local Government, The groups are held in 9 hectors large planted enclosures protected through electrified fences. In the near future it is planned to realise the first group back in to the wilderness. Further more individuals animals will be on loan to international Zoos for breeding purposes. Less than two years later in 1993 opened Pandrillus the Afi Mountain Wildlife Sanctuary, again in Cross River state, Nigeria. Pandrillus started at first an Information campaign in 17 local villages on and around the Afi mountain with the aim to build a partnership among all interested communities, local hunters were involved in wildlife protection patrols to discourage illegal shootings and trappings. On Afi Mountain wild Drills still survive, with other endangered primates including the Nigerian Chimpanzee () and also the most endangered Gorilla subspecies, the Cross River Gorilla (). The rugged massif (1400 m) is listed as an important bird area for migrating swallows in Africa. Pandrillus is not only responsible for education and protection but is also the largest employer in the area offering jobs for the local population as tourist guides, animal keeper, Traders, and skilled craftsman, for the local government a very important aspect for the whole region and its requirements. Limbe Wildlife Center was founded in 1993 as a collaborative effort between the Ministry of Environment and Forests and Pandrillus. LWC is home to 17 primate spices native to Cameroon, including Drills, Gorillas, Chimpanzees, Mandrills, Baboons, Mangabeys and Guenon species. 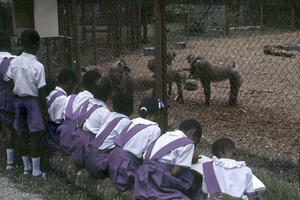 LWC focuses on education and receives over 25,000 Cameroonian visitors annually. LWC education program is extensive including student visits to the center, Nature clubs, Outreach programs and performances in remote schools, field trips, holiday galas and rallies. Currently over 50 Drills are held here in a large natural enclosure. The regional focus of Pandrillus is Drill habitat, spanning the international boundary from the Cross River east to the Sanaga River. By working with federal government agencies in both countries, Pandrillus is well-positioned to facilitate activities and initiatives between Cameroon and Nigeria. Training of Pandrillus staff in both countries is enhanced. For example, in 2003 Pandrillus carried out the repatriation of 2 adult female Gorillas smuggled into Nigeria from Cameroon and later seized by federal authorities. The event was a landmark for official collaboration between the two governments with respect to wildlife smuggling and coordination on environment issues, and was widely featured in local and international media. The Gorilla’s successful repatriation brought positive reinforcement to the relatively new spirit of transboundary cooperation for wildlife protection.